City blocks can be of almost infinite variety. In some cities, blocks are often perfectly uniform, as in large gridded areas of Manhattan and many other US cities. Elsewhere, blocks are usually irregular ("organic"), as in most European city centers and the oldest parts of Boston. I find the complex forms typical of older cities highly attractive, but either type is acceptable, and cities can be built having some districts with regular blocks and some with organic patterns. 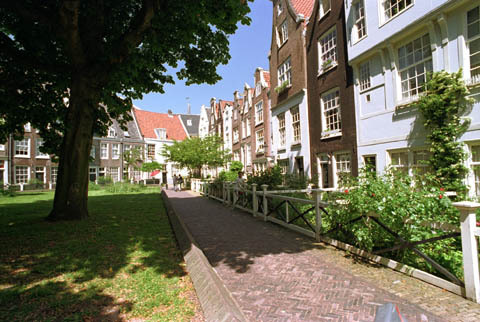 There are a number of aesthetic advantages to crooked streets, but straight streets are certainly acceptable. One advantage of irregular streets and blocks is that it is simple to arrange short walking routes to the district center, which is an advantage for everyone. The districts in the city center will see the most use by people whose homes are in other districts and cities, so these districts would benefit the most from a regular street pattern. Smart phones simplify the task of finding your way around an unfamiliar place. The Reference Block is of average size. It is roughly rectangular and measures about 80 by 60 meters (measured to the centerlines of the encompassing streets, which are 5 meters wide). The interior courtyard is about 60 by 40 meters. About 88 blocks of this size would comprise a single district, although most of the blocks would be of a different shape. Blocks should not be too much larger than this in order to provide a variety of walking routes even to nearby destinations. (See Jane Jacobs on this point.) Blocks can be made considerably smaller than the Reference Block, but the streets must be made proportionately narrower in order to maintain relatively high density. As the years have gone by, I am increasingly favorable to very small blocks, which provide an intimate feel. 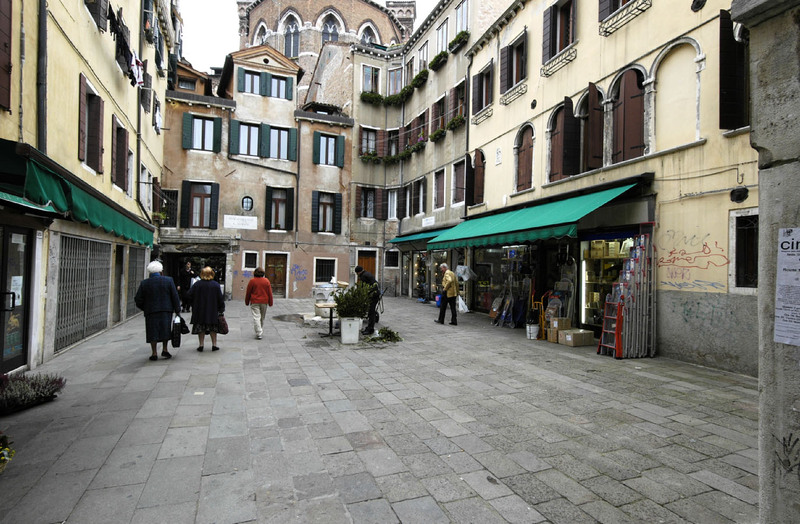 A small neighborhood square in Venice, one of hundreds. Small squares would be located at the intersections of most streets. These are the ideal location for small businesses serving the neighborhood, such as grocery stores, cafés, etc. They provide a natural place for people to meet and socialize. Ideally, they should be large enough that the winter sun shines into them at midday. Absent the transportation issue, densities might be lower than proposed. However, no reasonable topology and transport scheme can keep maximum transport times within the metropolitan area well under one hour unless densities are comparatively high. (For comparative examples of density, see Floor Area Ratios Illustrated.) Historically, smaller cities have more internal open space and are often built only three stories tall. Interior courtyards (the open space inside a city block) admit daylight to building interiors and provide green space adjacent to most buildings. The ownership and use of interior courtyards is controversial. I generally favor community open space with paths threading between the buildings. This is semi-private space but open to anyone who wants to use it. Many will favor private back yards, each fenced off from the other. 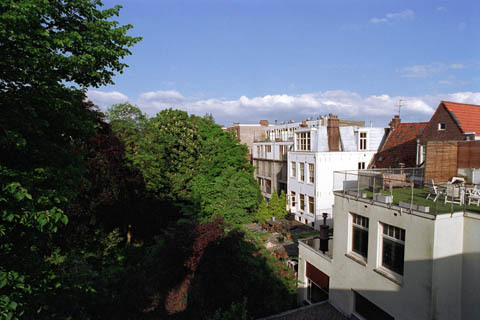 The second photograph depicts a courtyard which is accessible only to those living on the ground floor. Both arrangements can be provided, in different blocks. This concludes the basic description of the Reference Design for carfree cities. Of course, in most instances, considerable variations will have to be made between the Reference Design and actual practice in a given location. However, the Reference Design still serves as a useful guide in developing large carfree areas in both new and existing cities.